What do you do in an emergency situation during that agonizing wait to get to the hospital … or be seen by the doctor … or wait for the cops to come? What do you do in that emergency situation when the doctor you were counting on tells you “there’s nothing we can do”? Or my personal favorite, “this condition is incurable and progressive. We recommend you look into hospice care and grief counseling” (yes they actually said that). What do you do in that emergency situation when it looks like you are going to miss your flight, or your car is going to be towed, or you just experienced a severe personal trauma? Yes, today we have a simple and easy emergency protocol that you can try in any or all of these situations. You just might surprise yourself, how powerful your mind really is. 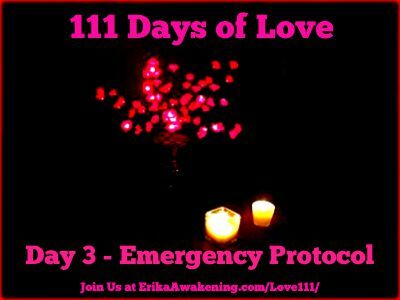 Recently I have been receiving a lot of questions from people about my famous “Emergency Protocol.” So for Day 3 of 111 Days of Love, we teach the basics of the emergency protocol. One way to think of the emergency protocol is like energy healing CPR. Practice it now, just as you would CPR, so that it is an instinct and a reflex and a habit when the time comes that you need it. The more you train your mind to produce results, the faster you will be able to achieve results in an emergency! The emergency protocol is a quick, simple, and easy energy healing technique that can reverse symptoms quickly. I discovered the emergency protocol out of desperation during Fritz the Cat’s near-death experience. Fritz had been in the veterinary hospital with severe kidney failure for 48 hours on intravenous fluids. I received a horrifying call from the veterinarian letting me know that even with all the fluids, his creatinine number had only barely improved. It looked like Fritz the Cat was not going to live much longer. Out of desperation and lots of prayer, I received the intuition to start EFT tapping (Emotional Freedom Technique) in the way described in this article. Lo and behold, I went to the vet to pick up Fritz the Cat expecting the worst. And the vet told me she had good news. His kidney numbers had dropped DRAMATICALLY in the time period in which I discovered and applied the emergency protocol. Encouraged by this progress, I continued using the emergency protocol pretty much every day for Fritz the Cat. And ultimately we achieved what the vet told us was not going to be possible. We got Fritz the Cat back into the NORMAL range for his kidney numbers. A year later, when he was tested again, his numbers were still good. With this result under our belt, I experimented with using emergency protocol in a wide variety of situations and was usually amazed by the results. Loss of appetite or apparent lethargy would correct in a matter of minutes. The emergency protocol is now a key tool in my energy healing basket. I like to think of it as energy healing CPR. It’s the first thing I use if I am feeling panic or trauma. I used it to reverse Harvey the Cat’s paralysis within hours and a few days, far ahead of the “normal” schedule, and to save his life. We want to make clear at the outset that the emergency protocol is not always a substitute for conventional medical care. The emergency protocol has certainly saved us from making many trips to the vet or the doctor. For example, if my cat was not eating, I would try emergency protocol first. Often the problem would get solved immediately, and we would have no need to visit the vet. In another case, we did go to the vet, but the antibiotics prescribed for Fritz the Cat’s recurrent urinary tract infection did not work! So we kept using the emergency protocol, and the situation resolved without even touching the second round of antibiotics that we were given. On the other hand, for example in the situations of the near-death experiences of each of my cats, we use the emergency protocol right alongside conventional Western medicine. We use Western medicine as a way of “buying time” so we can do the deeper healing necessary to resolve the condition fully. If you need emergency medical or veterinary care, by all means, please get it. You can use the emergency protocol described here while you are waiting to be seen by a doctor or vet. Indeed, that is exactly what I did to reverse Harvey the Cat’s paralysis a couple of months ago while we were waiting to be seen by the veterinarian. As well, the emergency protocol is not a substitute for learning my entire Holistic Belief Reprogramming healing method … You can get some astonishing results with just this one tool. However, results will be far, far better if this tool is used alongside all the other tools that I practice and teach. Why Does the Emergency Protocol Work So Fast? Seeing Harvey the Cat in the light means seeing him fully healed. Why does the emergency protocol work so fast? Let’s use a practical example. I used emergency protocol again this afternoon, just a few minutes ago. We are in the midst of an intense heat wave here in San Francisco, and Harvey the Cat was breathing too fast. We want his breathing at rest to be about 20 breaths per minute. He was stuck around 30 breaths per minute. When I returned to the other room to check on Harvey the Cat, his breathing dropped almost instantly from 30 breaths per minute to 19 breaths per minute. How did this healing result happen so quickly? Emergency protocol works at the level of our subconscious mind. We are using powerful language from A Course in Miracles that speaks directly to our Higher Self. Essentially, at any given time, we are choosing between two “channels” in our life. God or the ego. You can think of this as choosing between two parallel universes. In one parallel universe, the ego rules with fear, sickness, conflict, and death. In the other parallel universe, we tune into God energy … and all faulty perceptions are corrected. God’s world, which is available to us at any moment in time, is devoid of pain, sickness, or death. We access that world simply by “tuning in” to that channel in the subconscious mind. The emergency protocol is fast, simple, easy, and highly effective. It is not a replacement for learning my holistic healing system. It can, though, buy you time in an emergency and produce some truly astonishing results very fast. Imagine how pleased I was when Harvey the Cat regained the use of his paralyzed left leg, tail, bladder, and bowels within a few hours of his straddle thrombus instead of within two to three WEEKS. That is what I mean by an astonishing result. You can learn the basic tapping sequence by following along, tapping where I tap, in any of my free YouTube videos at http://youtube.com/ErikaAwakening. I also offer an Intro to Emotional Freedom Technique video here. 1. Nothing I see [examples: in this hospital room, in these lab results, in Harvey’s breathing] means anything. 2. I have given everything I see [on this street, from this window, in this place] all the meaning that it has for me. 4. These thoughts do not mean anything. They are like the things I see in this room. And you continue on as long as you need to continue on … Sometimes the problem resolves almost instantaneously. This can be especially true if you practice the emergency protocol a lot, because it is a mind training tool. The mind becomes more and more effective at correcting mistakes and tuning in to the “God channel” we talked about before. Sometimes, as in Harvey the Cat’s current situation, there is a much grander healing process in progress. And so I have used the emergency protocol over and over and over again over the past few months as each new issue came to conscious awareness. 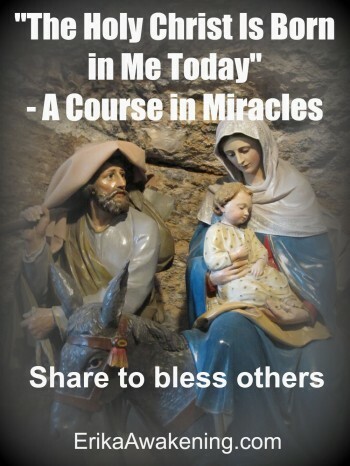 For your convenience, I have provided the full list of the 365 A Course in Miracles (ACIM) Workbook titles here. I do recommend, however, that you get your own copy of the book and keep it handy. I feel so grateful that I took it with us to the vet the night Harvey the Cat was paralyzed. To learn advanced applications of the emergency protocol, please sign up for private coaching sessions with me here. We hope you enjoyed Day 3 of 111 Days of Love. Each day until Christmas Day we will be sharing inspiring quotations and powerful lessons in love that I learned after my near-death experience in 2006. These teachings ultimately became the foundation of my acclaimed 15-Week Miracle Coaching Program. We have a brand new Facebook group for 111 Days of Love – Join us now. We also intend to provide deeper coverage and transformation tools as part of my ongoing Gold membership. Join us now and get the maximum benefit from 111 Days of Love. We will also be launching the brand new 30-Day Gratitude Challenge … stay tuned for details about that by getting on our newsletter list here. and remember to confirm your subscription or you’ll miss out on these amazing 111 Days of Love. Look forward to seeing you on this wonderful journey into 111 Days of Love. First of all, somewhere you mentioned using a surrogate, but I don’t know how that’s supposed to work. Last night, I tapped, using your procedure, while saying to myself, the titles of the table of contents of A Course in Miracles (Workbook for Students), as you described. However, I tapped on myself. Is that how the procedure is supposed to work? Secondly, most of the titles don’t mention the cat at all. it’s just a few titles among the first set in which the cat’s name can be inserted. What ties the procedure to the cat (or to whomever else we’re trying to apply it to)? 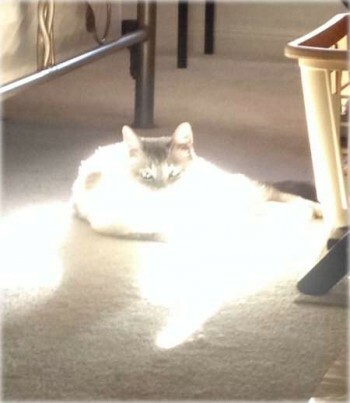 What is it that helps to attract a miracle for the cat (or person, or whomever) specifically? Thanks for the questions. I’m very sorry to hear about your cat. Is the cat receiving subcutaneous fluids? You may need to buy yourself some time here to get deeper into this work. I definitely will use integrative medicine (fluids, meds, etc.) to buy myself time to tap. Yes, you tap on yourself (we call it surrogate tapping), and yes I often adapt the titles to the specific situation. However, since you are tuned into the energy of the specific situation by tuning into your distress, the titles you are saying are automatically applying to that energy as well. If you’d like to do an intro session with me to jump start this healing, please email me at Erika @ ErikaAwakening.com. Wishing fast healing for your little one. I usually start praying or asking others to pray for me. This is what we did when my mom was gravely ill. My dad had to make the tough decision on whether to pull the plug or not. I couldn’t imagine being in his shoes. But he also wanted to honor my mom’s wishes too. I could see where people prone to anxiety would really get benefit from this kind of thing. So glad it’s working for you! Hmmm I feel curious why you would limit the technique to “people prone to anxiety” … I don’t really feel heard or seen when I read that. It feels like a fear response to me, to something that is really powerful. In these situations, I pray very hard. I also have to remind myself to stay calm. It’s easy to act on emotions and go from a calm state to a panic state. I just remember to keep Jesus in mind at all times and ask that He provide healing and comfort. This is the first I have ever heard of this technique so I feel a little skeptical. However I feel that it is always good to have alternatives in place whenever emergencies may arise. What if you couldn’t get to a hospital or medical personal? If I were faced with this situation then I would for sure take matters into my hands and do whatever was necessary to spare the life, whether it be an animal or a human. Sure I can understand the skepticism, because this technique operates on the level of our subconscious mind. And the vast majority of us were never trained in school to use our deeper mind to solve problems. On the other hand, what is the harm in trying it out and seeing whether it works for you. My friend just used it to get his internet service to come back on, when the service provider said it could not be fixed for a week. I also have used it many times for issues like that, tech issues, inconveniences, problems of all kinds. It really can be applied to anything. Sounds like an effective technique. I should rethink the way I face emergency situations. I tend to get stressed before I get myself to finally calm down and think about plan B. Yes, Elizabeth, and now that stress can be turned to your advantage. When the negative emotions come to the surface, it is actually an opportunity to cleanse the subconscious mind. The people who have the most difficulty using these techniques effectively are those who are out of touch with their feelings. When I am coaching someone, I must first get them in touch with their feelings before they can get maximum results. So your stress feelings could actually be helpful! We always need to be prepared for an emergency whether if it is for helping our pets or family or even a stranger. Thanks for sharing the emergency protocol. I’m not sure I fully understand how to do this from your article. So for example would I take the first statement (1. Nothing I see means anything) and tap the inside of the eyebrow, then take the second statement (2. I have given everything I see all the meaning that it has for me.) and tap the outside of the eyebrow, etc? Or Take the first statement and go through each point, then the second one, and so on? Thanks for the question. I probably need to add some more instructions to the article to make all this clear. First, all of my tapping is highly intuitive … so while this is a rough guide to the protocol … in practice, I would do whatever feels right in the moment. If repeating a particular phrase on every point feels helpful, then I would do that. Otherwise, one statement per tapping point is fine. That would be an example of a sequence where I’m not rigidly applying the order of the statements. Very useful blog post on the emergency protocol tapping. Perhaps you can make a tapping video of the emergency protocol, so that we can see ‘live’ on how it is done. Thanks Hans. That’s a good idea … I will give that some thought. Thanks for posting the Question Pier! Erika, thank you for answering the question! I have a similar situation as well. Yes, it does reminds me of something from my past. Bully/Victim dynamic! Shadow work! Not surprising since I am tapping the personal power challenge again. Doodlebug offered up a mirror one day last week on our walk but not sure or clear on the message just yet! Hmm, this is very interesting. I am open to all kinds of things so I would not dismiss this technique. I am going to do some more research into this! 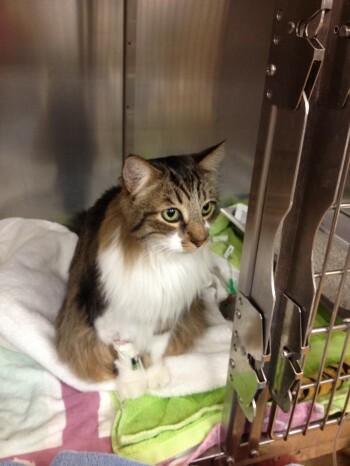 Thanks for sharing your story and I am glad to hear your kitty is doing better! I was skeptical when I began reading, but once I read the emergency protocol energy healing cpr mantra (for lack of a better word to describe it) I felt an instant release of weighty pressure from my being. That was enough to help me see that this is just what I needed. Thank you. Wow Elizabeth, thanks for sharing! Yes, the words are so powerful. I love how you said that, “instant release of weighty pressure from my being.” Awesome! Maybe I’m stubborn, myself a lawyer and my husband an MD, but I’d like to see broader studies of your technique. Have you conducted objective studies with control groups yet? Or are all your successes based on anecdotal evidence? Thanks! 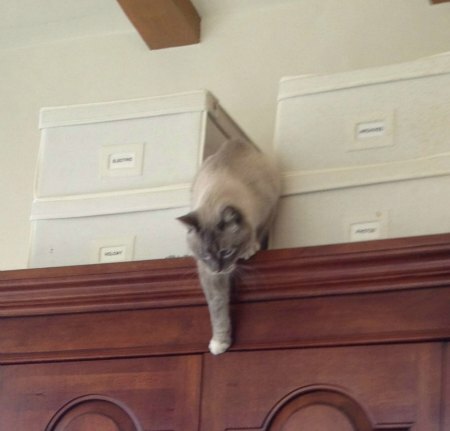 Ever hear of Schrodinger’s cat? If there was something wrong with my dog or a human in my life, I would see a trained medical professional immediately. Yes, Robin, so did we. But what happens when – as happened for us when Harvey was first paralyzed – they basically tell you there is nothing they can do? What if they tell you, as they did for us, that they basically never see a positive outcome in a situation like this and they don’t recommend treatment? Where do you turn then? Thank you Erika Awakening, one question: this protocol can be used only in health issues, or can I use it also for other situazions that engenders fear, anger, ecc.. ? Because in the last period I have a dog of the appartment near mine that’s bothering me, sometimes, and I noticed I have some fear abot this situation.. could I use this to face fear, and heal also this kind of situation? what is the message this dog has for me? does this remind me of something from the past? is there a mirror here?